Currently the most popular item flying off the shelves is the Playstation 4. With this release, Sony are focusing more than ever on games and have made an incredible gaming machine, with fantastic controllers and accessories. In the battle against the Microsoft Xbox One, we see this being this year’s most popular console. Read more in our Playstation 4 preorder post. Sony PlayStation 4 on Shop Ireland. This year’s big hit from Pixar, Monsters University is the prequel to the original Monsters Inc, and explains how the main protagonists met and became best friends. Monsters Inc is one of the classic Pixar movies and this prequel is most popular with fans of the original. Monsters University on Shop Ireland. One of the best selling books in Ireland this year, Alex Ferguson “My Autobiography” tells the story of Sir Alex and his 27 years managing Manchester United. Arguably the greatest manager in the history of football, the book tells how Sir Alex created the atmosphere at the club through all the ups and downs. Alex Ferguson My Autobiography on Shop Ireland. Of all the One Direction toys, this Niall fella seems to be the best seller. Not a day goes past when one doesn’t up and walk out. Will nobody think of poor Liam? One Direction Fashion Doll Niall on Shop Ireland. You know it’s Christmas when they roll out another set of hits, and this year is no different. This year, Various Artists have been hard at work making good clean generic pop to fill your stereos. It features 2 CDs filled with Various. Now Thats What I Call Music! 86 on Shop Ireland. The latest of the books by David Walliams, this is another hilarious kids book that is well worth a read. Creepy, funny and hard to put down. Demon Dentist on Shop Ireland. Diary of a Wimpy Kid is part of the series of books by Jeff Kinney that tell the tale of a middle-school weakling named Greg Heffley. With seven books in the series, Jeff, who originally wanted to be a cartoonist, has created one of this year’s best selling books. Diary of a Wimpy Kid: Hard Luck on Shop Ireland. Diamond is the latest in the Hetty Feather series of books by Jacqueline Wilson. The books follow Hetty Feather, abandoned at the Foundling Hospital as a newborn baby, as she grows up in a foster home prior to returning to the hospital. Diamond (Hetty Feather) on Shop Ireland. The twelth release in the series, this features more pop from the likes of will.i.am, The Vamps, One Direction and more. It comprises 23 tracks across two discs. Pop Party 12 on Shop Ireland. 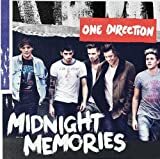 Speaking of One Direction, their CD, Midnight Memories is currently selling well in Ireland. Featuring such tracks as “Best Song Ever”, “You & I”, “Why Don’t We Go There” and “Does he know?”. Midnight Memories on Shop Ireland.